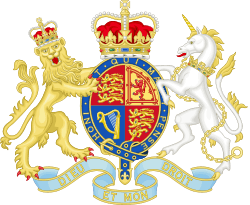 The Department for Environment, Food and Rural Affairs (Defra) is the government department responsible for environmental protection, food production and standards, agriculture, fisheries and rural communities in the United Kingdom of Great Britain and Northern Ireland. Concordats set out agreed frameworks for co-operation between it and the Scottish Government, Welsh Government and Northern Ireland Executive, which have devolved responsibilities for these matters in their respective nations. 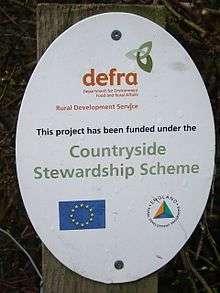 Defra also leads for Britain at the EU on agricultural, fisheries and environment matters and in other international negotiations on sustainable development and climate change, although a new Department of Energy and Climate Change was created on 3 October 2008 to take over the last responsibility. It was formed in June 2001 under the leadership of Margaret Beckett, when the Ministry of Agriculture, Fisheries and Food (MAFF) was merged with part of the Department of Environment, Transport and the Regions (DETR) and with a small part of the Home Office. The department was created after the perceived failure of MAFF to deal adequately with an outbreak of Foot and Mouth disease. The Department had about 9,000 core personnel, as of January 2008. The Department's main building is Nobel House on Smith Square, SW1. In October 2008, the climate team at Defra was merged with the energy team from the Department for Business Enterprise and Regulatory Reform (BERR) to create the Department of Energy and Climate Change, then headed by Ed Miliband. The Permanent Secretary is Clare Moriarty. Some policies apply to England alone due to devolution, while others are not devolved and therefore apply Britain as a whole. Policies for environment, food and rural affairs are delivered in the regions by Defra's executive agencies and delivery bodies, in particular Natural England, the Rural Payments Agency, Animal Health and the Marine Management Organisation. Defra's overarching aim is sustainable development, which is defined as "development which enables all people throughout the world to satisfy their basic needs and enjoy a better quality of life without compromising the quality of life of future generations." The Secretary of State wrote in a letter to the Prime Minister that he saw Defra’s mission as enabling a move toward what the World Wide Fund for Nature (WWF) has called "one planet living". ↑ "Concordat between MAFF and the Scottish Executive". ↑ "Concordat between MAFF and the Cabinet of the National Assembly for Wales". ↑ "Devolution: Subject specific Concordat between MAFF and the Scottish Executive on fisheries". ↑ "Defra departmental report" (PDF). ↑ Harrabin, Roger (3 October 2008). "Marrying energy demand and supply". BBC News. Retrieved 2009-05-22. ↑ "Our ministers". GOV.UK. Department for Environment, Food and Rural Affairs. Retrieved 12 May 2015. ↑ "Cabinet Office List of Ministerial Responsibilities, July 2010". Cabinetoffice.gov.uk. 2010-09-16. Retrieved 2011-11-18. ↑ "List of ministerial responsibilities (including Executive Agencies and Non-Ministerial Departments)" (PDF). Retrieved 2011-11-18. ↑ "Marine Management Organisation established", press release by Defra, 1 April 2010 (from the Defra website.